Your breath is a powerful way to connect into your mind and your heart. It allows you to slow down, take control of your thoughts and emotions, and shift your energy vibration. The deeper you breathe, the more your mind relaxes allowing you to tap into the power within you. 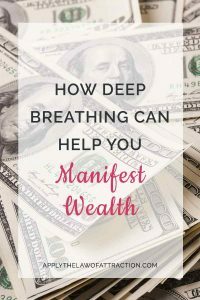 When used correctly, deep breathing can help you manifest wealth. Your breath does more than give you oxygen. It cleanses you, relaxes you, and energizes you. Try holding your breath for a moment and see what I mean. In no time, you'll feel tense and adrenaline will begin to kick in as your body starts to engage in flight-or-fight mode for survival. In other words, holding your breath brings an instinctive sense of fear that lowers your vibratory energy. Whenever you feel tense or worried, you naturally restrict your breathing – breathing more shallowly, using only the top third of your lungs, and sometimes even holding your breath. It's an unconscious reaction that muddles up your manifesting energy. Yet as soon as you relax and let go, you breathe deeper, relax, and shift your energy to a higher vibration. Since most people are concerned about money, when they think about money their breathing alters and unconsciously shifts to a level of breathing that sends an energetic signal that money is associated with fear. This automatically restricts wealth manifestation. Yet, you can easily undo this and use deep breathing to manifest wealth by simply focusing on your breath. Every morning and evening, take 4 deep breaths, expanding your lungs and diaphragm fully. Feel the air go down into your core. Imagine that the expansion of your breath is the expansion of money in your life. The more air you breathe in, the more deeply you breathe, the more money you have. Throughout your day, check in on your breathing. Notice if you are tense and relax. Let your lungs expand fully and breathe deeply. Any time you feel worried, doubtful, or fearful, take a deep breath. Feel yourself relax and calm down. Deep breathing is a simple task that most of us fail to do. Yet, your breath has the power to manifest wealth and any other desire you may have. Thank you Elizabeth for the many inspiring articles on your site, since practising deep breathing I am able to connect to my heart energy easily. I also receive a lot of ideas, insight, manifesting is easier and I use it release negative emotions as well. My life just keeps getting better and better. Thank you!! !